Now that spring has officially arrived in central Ohio, the folks at ZipZone Canopy Tours are busy preparing for their seasonal opening this weekend. 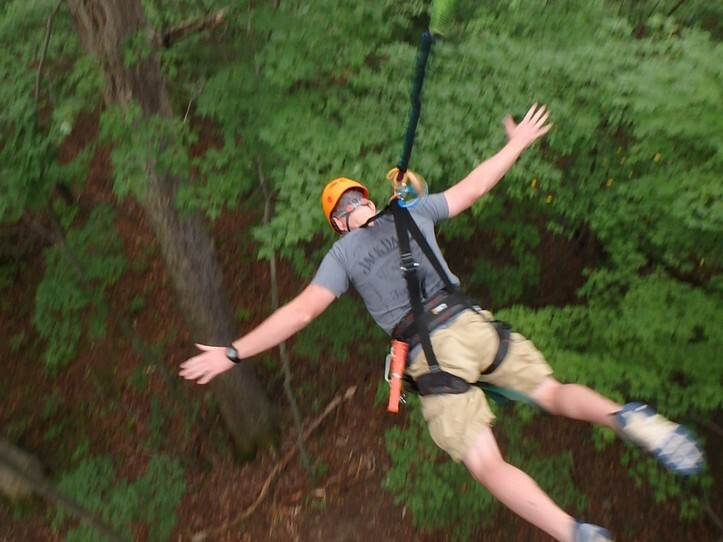 Located on the beautiful grounds of Camp Mary Orton in Worthington, ZipZone Canopy Tours is home to the first hands-free, fully guided zip line adventure course in Columbus. Since their grand opening in 2012, Jerrod and Lori Pingle, creators of ZipZone, have been thrilled with the warm Ohio welcome they’ve received. The Pingles are highly experienced zip liners who've been working in the industry for more than 25 years, and they're excited to finally have a course in their own backyard. In addition to their signature Canopy Tour course, which winds its way through 20 acres of breathtaking forestry, ZipZone offers several other tours and events that you’ll definitely want to check out. Looking for an adrenaline rush? Thrill seekers and adventure enthusiasts will love this all-new course. The guided tour, which lasts approximately 1 to 1 1/2 hours, features two sky bridges, two zip lines and the option for a thrilling OuickJUMP free fall or rappel experience. ZipZone and Columbus Metroparks are excited to offer this new series of educational adventures. The tours, which are led by a ZipZone guide and a Metroparks naturalist, are designed to introduce participants to the local environment. Each tour is unique in that the naturalist provides ever-changing information and education about the area at that specific time of year, including facts about local plants and animals. One of ZipZone's most popular tours, Full Moon Zip Lining takes place in the complete dark, with only the light of the moon – and a ZipZone employee – as your guide. Offered once a month, around the time of the full moon, this tour fills up fast, so call today to make your reservation. ZipZone Canopy Tours is located at 7925 North High Street and is open daily from March 28 to November 8. ZipZone tours are the perfect family friendly activity and are open to children as young as seven. In addition to military personnel and AAA members, discounts and specials are also available for kids' birthday parties, Scout troops and groups of eight or more. Call 614-847-9477 or visit www.zipzonetours.com to schedule your next adventure.